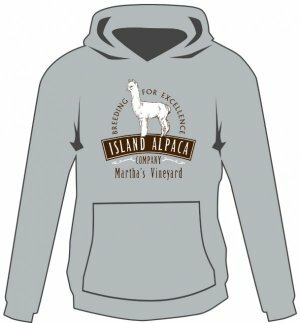 NEW -- Island Alpaca Hooded Sweatshirts for Children and Adults. Thank you to Melissa in production, who was so kind to send us a photo! 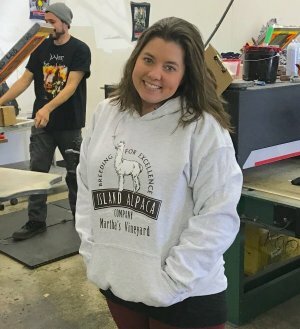 Our new hooded sweatshirt for all seasons features our logo on front, cotton - poly blend, double-lined hood with matching draw cord (draw cord on adult sizes only) and front pouch pocket. Made in the USA! Features: Two-color logo on front, blank back. 8-ounce, 50/50 cotton/poly pill-resistant, air jet yarn. Double-needle stitching and Double-lined hood with dyed-to-match drawcord, 1x1 rib knit cuffs and waistband with spandex. Front-pouch pocket. *Note, additional charge for 2XL and larger.